Location : North Hollywood Park (at the corner or Magnolia Blvd & Tujunga Ave). For the past 18 years, Hands4Hope LA has served youth and families. 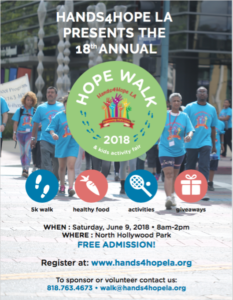 Each year we set a goal of expanding our services and events, and so each year to spread the word about what we do and bring together the youth and families in the North Hollywood and surrounding areas we host a 5k HopeWalk & Kids Healthy Activity Fair in a local park. 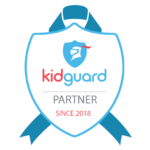 Sign Up For Free Admission and Free Kids’ T-Shirts! The Hands4Hope LA 5K Hope Walk around NoHo Arts District is a family tradition, designed to increase kids health awareness and get them moving. The event features our Kids Healthy Activities Fair which encourages youth and their parents to create a healthy lifestyle, and offers over 20 different activities for the chance to win fun toys and prizes, and A Taste of Healthy NoHo which involves local restaurants and markets providing the event’s participants a free taste of their healthy food choices. 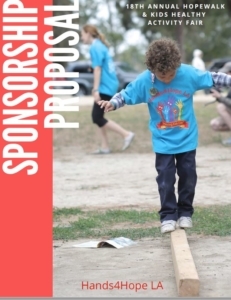 A Great Way for your Business to Participate in the Community! 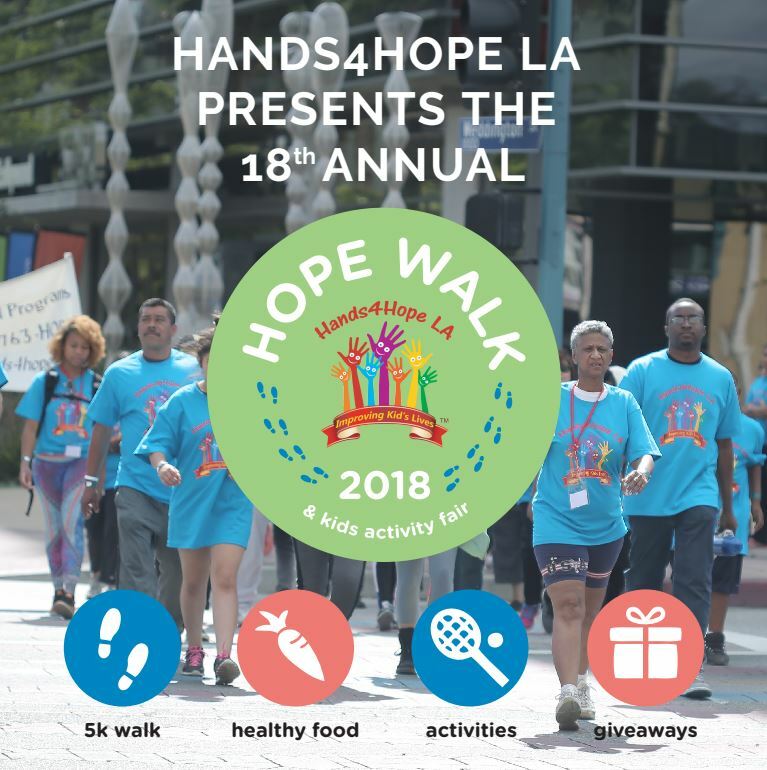 For more information, call us at 818-763-4673 or email walk@hands4hopela.org. Create your own social media posts to get your friends involved! Toys & Cards | Electronics | Snacks (individually packaged) | Bottled Water | Coffee | T-shirts | Printing / Digital Marketing Costs | Bounce houses | Sound and DJ Services, etc! VOLUNTEER WITH US! Sign up now! Thanks to Our HopeWalk Committee for their generous donation of time and talent!